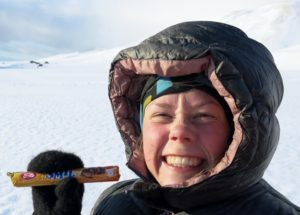 Scisnack | Future skiing conditions in Norway: Will I be a skiing grandma? Figure 1: Skiing in the alps of Sunnmøre, Norway. Will it be possible to take a similar picture in the near future? Photo: Tor Halvar F. Botnen. When I get old, I want to be a skiing grandma. For that dream to come true I need to become a grandma, and I need to remain somewhat fit. But the greatest issue might actually be the snow. 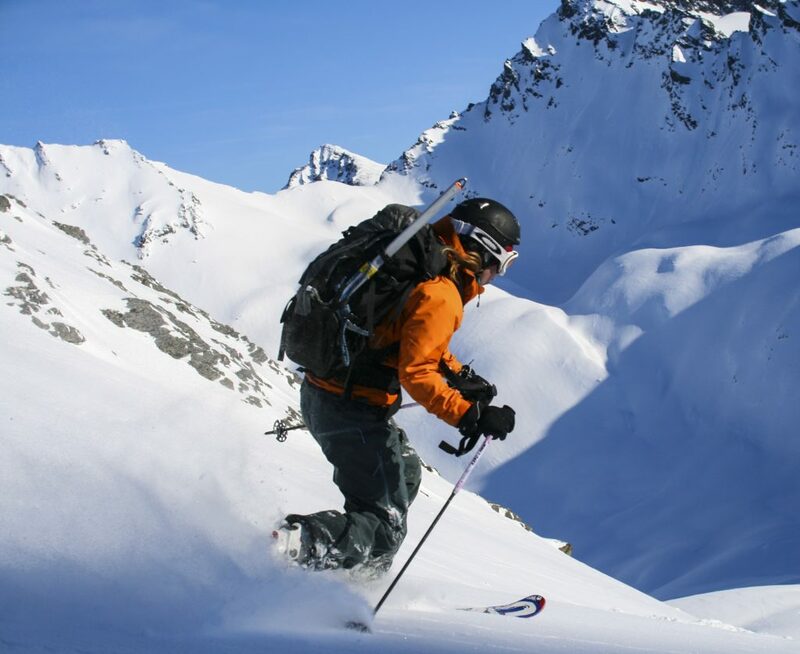 How will the skiing conditions be in Norway in the future? Projections of Norway’s climate [1,2] show that temperature and precipitation will increase. Higher temperatures mean shorter winters. More of the precipitation will fall as rain, and the snow will melt faster. Figure 2a shows an estimate of the change in number of days with snow each year from the end of the past century to the end of this century. The snow season clearly shortens. But during the season, how will the snow conditions be compared to today’s climate? Up in the mountains, where it is cold enough, won’t the increase in precipitation deepen the snow cover, and hence improve the skiing conditions? Let’s go back in time to my grandmas’ childhood and see how the snow conditions have changed since then. The past climate in most parts of Norway has become warmer and wetter [1,2,3]. Observations from the past century show a shortening of the snow season in Norway. Furthermore, the mean snow depth at lower altitudes has decreased. But there is also some good news for the Norwegian skier. Above a certain height, the snow depth has in fact increased. This is mainly related to the increase in precipitation. But this increase may not continue for long. Observations show that the altitude separating increasing and decreasing snow depths ascends as Norway gets warmer. At some point in time, the snow depth may decrease everywhere! Figure 2: Changes in a) number of days with snow covered ground and b) maximal annual snow water equivalent (SWE) in mm from 1971-2000 to 2071-2100 if the global emissions of climate gases don’t change. Grey shading in b) shows zero or positive changes. Image source and more details in . 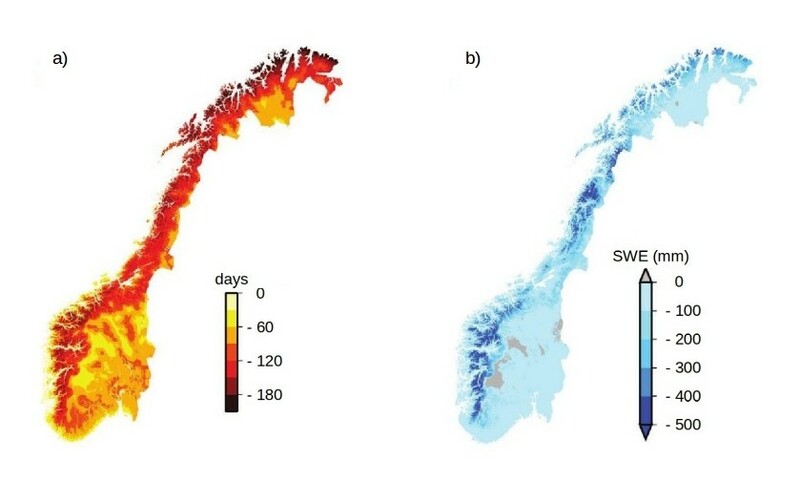 Climate models project decreasing snow depths in most parts of Norway (Figure 2b). We find the most dramatic decreases in the mountains in the west. However, in some small areas in the highlands, the maximum amount of snow might still increase (grey shading in Figure 2b). But be careful – more snow does not necessarily imply better skiing conditions. A warmer atmosphere can hold more moisture, so we expect precipitating weather systems to get stronger and last longer. This means heavier snowfalls. If the wind associated with the snow storms gets stronger, the snow will get harder and more packed (Figure 3). The snow might also get harder due to warmer and thus wetter snow. 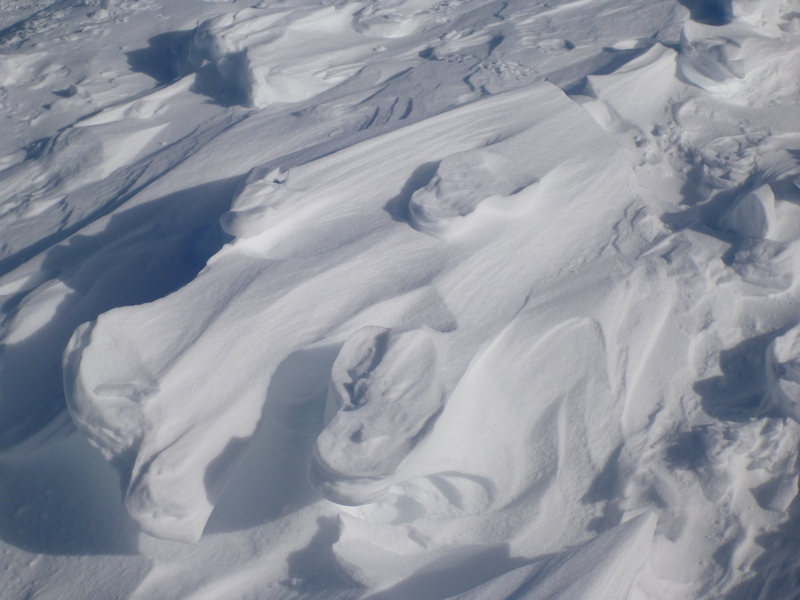 During the skiing season, the increase in precipitation, wind speeds and weather extremes might even cause more frequent occurrence of snow avalanches. These are not nice skiing conditions for a grandma! Figure 3: Wind packed snow makes the skiing more challenging (image source). In 2070, I will be around 80 years old. My old body will need to go further up in the mountains to get snow under my skis. The weather in the mountains is harsh, and might get even harsher in the future. But despite worse skiing conditions, there will be snow. My dream of becoming a skiing grandma can still come true, but it will require more effort for sure! Hanssen-Bauer, I., Førland, E.J., Haddeland, I., Hisdal, H., Mayer, S., Nesje, A., Nilsen, J.E.Ø., Sandven, S., Sandø, A.B., Sorteberg, A. og Ådlandsvik, B. (red.) 2015. Klima i Norge 2100. Kunnskapsgrunnlag for klimatilpassing oppdatert i 2015, NCCS rapport nr. 2 2015. Hanssen-Bauer, I., Hisdal, H., Mayer, S. 2016. Norges klimafremtid: Varmere og enda våtere. Naturen 140: 12-20. Dyrrdal, A.V., Saloranta, T., Skaugen, T., and Stranden, H.B. 2013. Changes in snow depth in Norway during the period 1961-2010. Hydrology Research, 44.1. Tagged Global warming, Norway, Precipitation, skiing conditions, skiing grandmas, snow, snow depth, snow in the future, temperature.